Arcadia Alvarado, the leading Democratic candidate for President of the United States, says she was "abducted by aliens." As the Mexican-American Governor of New Mexico, she's dealing with immigration, budget cuts and an alcoholic ex. She's about to toss her hat into the ring as a candidate for President in the most volatile political climate ever. But then...a lonely road and a nightmarish encounter have left her with terrible, half-glimpsed memories. And now she has to become President. To expose the truth-- and maybe, to save the world. Arcadia's quest is at the heart of this new monthly series from writer Paul Cornell (DEMON KNIGHTS, ACTION COMICS, Doctor Who) and artist Ryan Kelly (NEW YORK FIVE, NORTHLANDERS). With the help of her quirky staff, Arcadia will pursue the truth of her abduction into danger, mystery and awe. 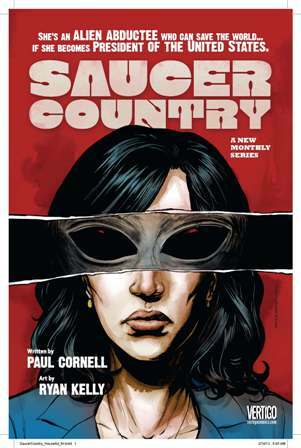 SAUCER COUNTRY is a dark thriller that blends UFO lore and alien abduction with political intrigue, all set in the hauntingly beautiful Southwest.